During the Shoah, Israel's oppressors sought to exterminate the Jewish People. However, in the German Valley of death, sparks of courage and fervor to observe the commandments arose. The latter brought to light the heroism and inner strength of the Jewish people, which no enemy could ever eradicate. Thus the Chassidim recount the lighting of the Chanukah candles of the revered Rabbi Sanz and his followers in the Miraldorf labor camp on Chanukah 5705. Physically and morally exhausted, the Jews of the camp did not know when the first day of Chanukah would fall. They did not have a calendar and lived isolated from reality. They went to the barracks of the Rabbi of Sanz, may his merit protect us, who drew out a tiny piece of coal to use as a pencil and tore a piece of a cement bag to write down his calculations. He thus began to write down numbers and calculate dates according to his own recollections, until he determined exactly when Kislev would fall. Approaching Chanukah, the Rebbe was assigned to work in the woodshed. 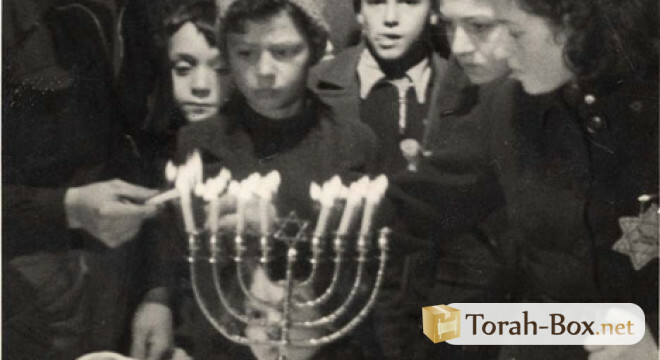 He took advantage of this unexpected miraculous opportunity to make a wooden menorah with the help of a few other Jews. But where would they get oil for lighting? They found a solution. From time to time, Jews received a dab of margarine as a food ration. Each dab of margarine represented a breath of life and a much-needed nutritious supplement to calibrate their weakened bodies. During the days of Chanukah, margarine became a breath of life and a food ration for the soul. By melting it, Jews collected oil for lighting the Chanukah candles. With unparalleled self-sacrifice, many Jews gathered together the dabs of margarine so critical for their survival and reserved them for lighting. How about the menorah’s wicks? Soon, the rags that covered their bodies were frayed at the seams to prepare wicks to honor the command of lighting Chanukah candles. 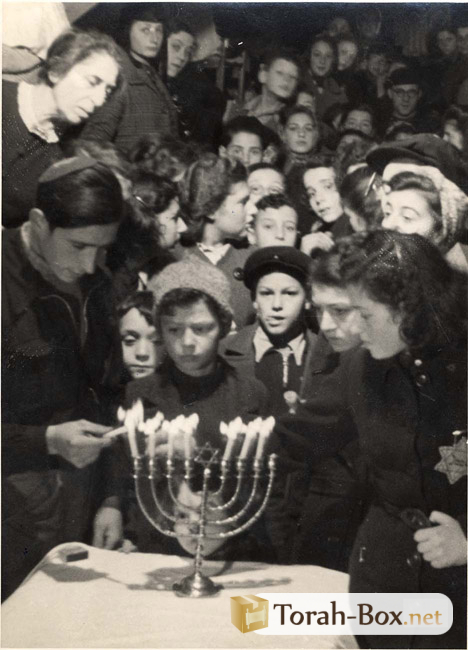 On the first evening of Chanukah, the Jews of the camp earned the merit of lighting Chanukah candles, as prescribed by law. The Rabbi, may his merit protect us, lit the flames which danced and trembled with sanctity ... A sublime happiness invaded the hearts of these unfortunate Jews. The Rebbe recounts: "The following day, a fire broke out in the barracks. The fire was difficult to contain and made ravages. Immediately, these miscreants came to conduct an investigation to unravel the origin of this incident. Now whoever dared lighting a fire in the camp was killed on the spot. But God showed mercy and we were all saved from their hands. " The Rebbe added with great emotion: "I will thank God, every day and every night for His mercy. And I will never regret praising Him for granting me the merit of observing the command to the light of the Chanukah candles right under the noses of these impious people. In addition, I emerged alive and unharmed from that hell, despite the terrible danger that hovered over me! At that time, we had a burning and deeply embedded desire within us to observe the commandments at any price. That is why questions such as: “'Does the law require we put our lives in danger to obtain the oil?” or “What is the status of this oil?” did not even cross our minds. No Jew would miss the opportunity to follow the commandment of publicizing the miracle. We felt that every moment of our life was in itself a miracle for which we had to thank the Almighty."